At any given time, in any given oil field across Kern County, there’s a good chance oil companies are fracking oil wells. It’s a perfectly legal operation, but a two-year old state law now requires companies to notify California’s Division of Oil, Gas and Geothermal Resources (DOGGR) any time a well is fracked. By law, the agency then must inform the public by posting the fracking information on its website within 60 days. However, the NBC Bay Area Investigative Unit discovered that’s not always happening. An analysis of the agency’s website revealed the state missed the 60-day deadline in at least 173 fracked wells. This concerns people who live near the wells in the community of Lost Hills. “At least inform the public and let them know,” said Estella Montiel, a 20-year resident of the area. The Center for Biological Diversity, an environmental nonprofit in Oakland, tracked this issue for the last six months, on at least three different dates comparing the oil industry website where companies voluntarily report fracked wells with DOGGR’s website, which requires the same reporting. 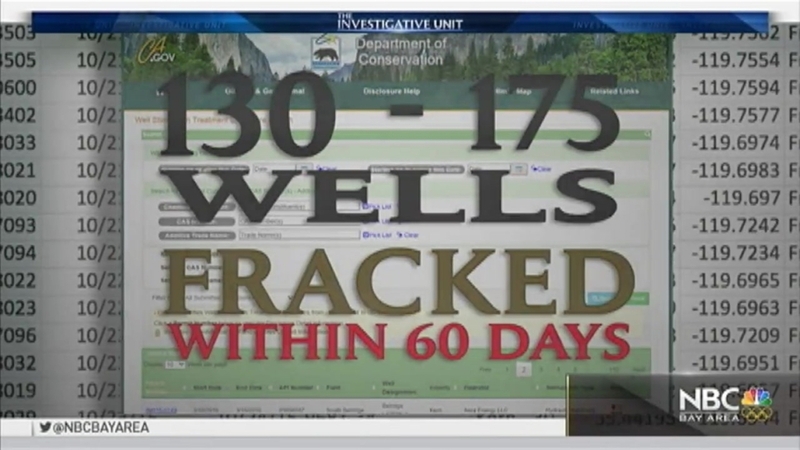 The NBC Bay Area Investigative Unit independently verified their findings and found on numerous dates in March, April and June between 130 and 175 wells that the oil industry reported fracked did not show up on DOGGR’s website within 60 days of the fracking operation. That averages out to a delay in about 28 percent of fracking notifications. What Is Fracking and Why Is It Controversial? Hydraulic fracturing, or fracking, is the process of pumping high pressure water, sand and a mix of chemicals to break up shale rock to release the oil that’s trapped in the underground shale rock. In 2012, NBC Bay Area’s Investigative Unit was the first to report the widespread use of fracking to recover oil in California was not being tracked nor regulated by state officials. The new law, called SB4, requiring oversight and public reporting of fracking operations followed NBC Bay Area’s investigation. In 2014, the Investigative Unit reported that DOGGR officials allowed oil and gas companies to pump billions of gallons of waste water left over from fracking into protected underground aquifers. The Environmental Working Group, which first helped expose unregulated and untracked fracking in California, would like to see a bigger separation between industry and the government. “We think the relationship between state regulatory agencies and the oil companies at least in Kern has been way too cozy. We’re trying to bust that up,” said Bill Allayaud, EWG’s California director of governmental affairs. State Sen. Fran Pavley, (D) Ventura County, authored SB4. Senator Pavley was instrumental in getting the new law passed through the state legislature. “I feel like I have part of my own reputation there,” Pavley said. Schilling, the agency’s spokeswoman, agrees. “We’re working on this on a daily basis. We want to make improvements. We want this program to be successful. We want operators to comply with it. That’s our goal,” said Schilling. While it’s ultimately the agency’s responsibility to post the fracking information on its website, the agency does have the authority to fine oil and gas companies up to $20,000 if they don’t comply with the law. “If they do not give us the information, we will fine them,” said Schilling. But NBC Bay Area discovered that even though the agency has issued 58 violations to oil and gas companies for failing to comply properly with theSB4, the agency has not handed out a single fine. The Western States Petroleum Association declined our request for an interview. A new bill is now before the state legislature to give the agency more enforcement tools including the ability to levy bigger fines against oil companies for failing to comply.